I’ve been thinking a lot in the last few years about the “small things” that we can be doing in our teaching that make a big impact for students and their learning. If we can focus on one or two things each year and refine over time, I think this could be as powerful as overhauling a course all at once. The following three suggestions are drawn from a workshop I’ve developed called “Small Changes with Big Impact. I’ve selected these three small changes as timely for implementation at the start of a new semester. Our classes often require students to figure out what aspects of the class “go together” to form the big ideas – how do Moodle resources and homework activities, for example, link up with other components of the course, or how do the beginning, middle, and ending segments of a class session support a central idea or question. Just within a lecture or class session, students can spend quite a bit of their cognitive effort trying to do make these connections, and often they give up on finding the connections, and just try to write down as much as possible (or nothing at all). As experts, we don’t just know more than our novice students, but we actually have a different way of organizing that information, which allows us to efficiently see patterns. For example, expert chess players can remember the positions of more chess pieces on a board than novices (Chase and Simon, 1973), and electronics technicians can reproduce large portions of complex circuit boards. They do this by grouping together pieces that functionally go together to create a set of moves or a larger piece of the electronic equipment. Also, students, as novice learners, will tend to focus on surface features when figuring out what goes together. Novice physics students, for example, will group together problems based on which ones have springs or incline planes, whereas experts sort them based on the problem solving approaches (e.g. conservation of energy) that can be used to solve them regardless of if they involve springs or inclines. In order to help our students as novice learners, we can make the organization lectures and overall class sessions transparent by overtly sharing the organizational scheme for a lecture and/or class session. For example, write an agenda on the side of the board and/or broadcast it as a message within an online session, then return to this outline throughout lecture, stopping to summarize a discussion or just to verbally indicate when you move from one topic to another. When instructors provided verbal cues (signposts) to the organizational structure of their lectures and class sessions (e.g. the first strategy is, the second strategy is, and so on) generally students will recall twice as many details in a given class period and also take better notes. Other suggestions for making organizational structures transparent are included in the Small Change handout accompanying this post. 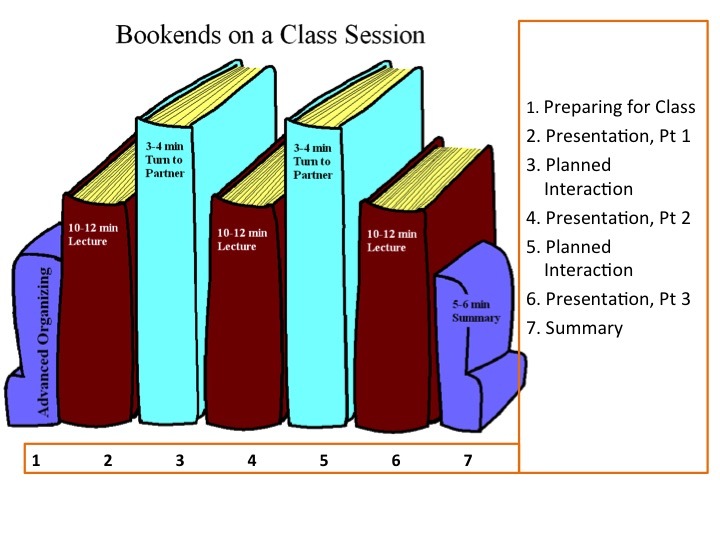 One strategy to address this is to break class sessions (whether more oriented to interactive lecture or active discussion or a mix of both) into 3 chunks that are interlinked by select, short activities. There are lots of ways to make these breaks richer and you’ll find some suggestions in the Small Change handout accompanying this post. We often wait until students turn in homework, assignments or take exams to find out whether they’re understanding the material, and we tend to wait until course evaluation time to find out what students have to say about their learning in our courses. A small thing you can do to help your students and your teaching is to get early term feedback about their learning and your teaching (as it supports or could better support their learning). Muddiest Point: What topics/concepts are still confusing after today’s class? One sentence recap: What was the most important point from lecture? Confusion survey: The following is a list of the concepts discussed this week. Cross out concepts you feel you’ve learned and circle concepts you feel you have not learned. In order to follow up, you can return to a clarify a muddy idea in the next class, send out an email reporting on apt recaps, record a short, informal video re-casting some of the confusions and post this to the course website, and/or or have your TAs revisit selected topics in recitation, discussion, or other study sessions. Gathering early-in-the-term feedback on your teaching can have a positive impact for you and your students. Instructors who collected student feedback, debriefed it with their students and made pedagogical changes with a consultant saw their course evaluations go up by 9% at the end of the semester. You’ll find more suggestions about early-in-the-term feedback in the Small Change handout accompanying this post.